City-Living.de offers you the best services in apartment homes in Frankfurt am Main. The company talks about commission-free living and is true to its word. City-Living’s fully equipped and comfortably furnished rental apartments are located in Frankfurt am Main’s most popular areas like the Nordend, the Westend, downtown and in Bornheim. These apartment homes are centrally located and are fortunate to have good transportation links. This is especially good for travelling businessmen who need corporate apartments. City’s rental apartments and hostels are spacious and economical at the same time. City-Living’s apartment homes give you that homely feeling that you crave for. City-Living not just gives you a place to stay but makes sure you don’t have to buy any stuff or bring stuff along with you. There is no need of a relocation agency for you here! City-Living’s furnished rentals are well equipped i.e. they have a fitted kitchen with a complete set of tableware, microwave, toaster, coffee maker, washing machine, DVD, TV, HiFi etc. 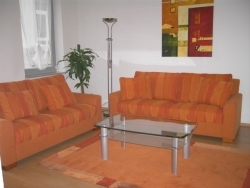 Bedclothes and towels are also included in these rental apartments in Frankfurt am Main. The Nordend Residence is located on the Bornheimer Landstrasse, one of the most sought after residential areas in Frankfurt. The Westend Residence is in the vicinity of the Grüneburg Park. This area is famous for its business offices and this is one of the best corporate apartment to stay in. The Freiligrathstraße houses the Bornheim residence. The downtown residence has exclusive one-, two- and three-room apartments in the centre of the city. City-Living’s website www.city-living.de offers details of short-term corporate apartments. These corporate apartments are fully furnished and have their own balcony. If you are planning a short business trip to Frankfurt am Main, the best place to stay would be City-Living.de’s corporate apartments. Just book your apartment online and move in. City-Living will keep everything ready for you! Right from hot water for a hot shower to a cosy bed to fall into for a good night’s sleep.